FCC and regulatory matters will fill the lion's share of the agenda when the ARRL Executive Committee (EC) meets on October 22 in Chicago. Topping the list of action items is a review of enforcement strategies -- a follow-on to discussions during the July 2015 meeting of the ARRL Board of Directors. This would include "ongoing consideration of revised plans and strategies for improved Amateur Radio enforcement, and actions to implement these." It also would address revisions to the ARRL Official Observer program. The EC also will review the status of -- and comments filed on -- the ARRL Petition for Rule Making (RM 11759) to the FCC, seeking changes in the 80- and 75-meter RTTY/data and phone/image subbands and to restore 80-meter privileges for certain license classes, among other changes in those bands. The Petition was filed in January. In addition, the Committee will discuss comments filed in response to its request to the FCC to delete restrictions on symbol rates for data communication and the establishment of a 2.8 kHz maximum occupied bandwidth for data emissions below 29.7 MHz. The FCC's April 2016 Report and Order, Order, and Notice of Proposed Rulemaking (R&O/NPRM) in ET Docket 15-99 also will be up for discussion. The FCC has yet to approve operational rules for the 2200- and 630-meter bands and finalizing the allocation of the 2200-meter band. 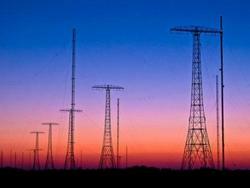 The R&O/NPRM raised several questions regarding how Amateur Radio might coexist with PLC systems used to control the power grid. The Committee also will hear updates on various regulatory items affecting Amateur Radio. Some of the FCC proceedings date back 3 years or more. In legislative matters, among other issues, the EC will hear a report on the status of H.R. 1301 -- the Amateur Radio Parity Act of 2015 -- with a focus on strategies to gain approval for the proposed legislation in the US Senate during the so-called "lame duck" session of Congress following the elections in November. Read more. Bidding in the 11th annual ARRL On-Line Auction begins on October 21 at 1400 UTC, and the auction will continue through October 27. During the past week, prospective participants have been able to view the nearly 300 items up for bid. Those planning to take part must register. 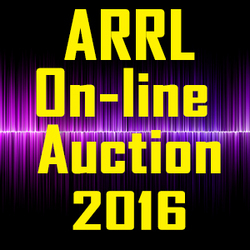 Participants in past ARRL On-Line Auction events may use their previous log-in information. Items on the block this year include QST "Product Review" gear -- already ARRL Lab-tested -- vintage books and publications, previously owned gear, one-of-a-kind finds, "Last Man Standing" TV series (starring Tim Allen, KK6OTD) items, and five of the ever-popular "mystery boxes" from the ARRL Lab team. Some of the premier items up for bid from the QST "Product Review" inventory include the Icom IC-7851 HF+6 meter transceiver, the Elecraft K3S HF+6 meter transceiver, the Yaesu FTM-400DR 144/430 MHz transceiver, and the Ameritron ALS-1306 HF+6 meter 1,200 W solid-state amplifier. 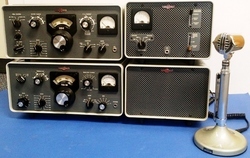 This Collins S Line is among the items on the block at the 2016 ARRL On-Line Auction. Among the book offerings are Radio Stations of the World, a special 1942 defense edition of The Radio Amateur's Handbook -- as well as many other vintage Handbook editions, plus In Marconi's Footsteps -- Early Radio, and Maver's Wireless Telegraph: Theory and Practice. Proceeds from the yearly On-Line Auction benefit ARRL education initiatives. The auction site only accepts Visa and MasterCard. Each auction item has its own closing time. Read more. From October 30 through November 1, members of the Military Auxiliary Radio System (MARS) will conduct a quarterly US Department of Defense (DOD) Contingency Communications Exercise (COMMEX). The quarterly exercise will offer training on the ability to provide communications following a "very bad day" scenario, when traditional forms of communications will likely be unavailable, Army MARS Program Manager Paul English, WD8DBY, said. The exercise will involve interoperability between MARS and Amateur Radio participants and is open to all members of the amateur community. "While the simultaneous loss of all communications nationwide is not likely, we are assuming there has been a massive nationwide outage, for training purposes," English said. "One objective of the exercise is to continue the partnership with the Amateur Radio community to help provide information about local conditions." Information gathered will be forwarded to the DOD to provide a better picture of what is happening around the country, he said. "During this exercise, we will use 60 meters, local VHF and UHF repeaters, and HF NVIS [near-vertical incidence skywave] Amateur Radio bands," English explained. "Our goal is to have a conversation about the local conditions in and around your county. During the conversation, our operators will be asking basic questions, such as the status of commercial power, public water systems, and road conditions. These will be person-to-person conversations; you don't need to use any digital modes or know any special messaging formats." To kick off this exercise, MARS is encouraging the Amateur Radio community to monitor 5,330.5 kHz from 0300-0400 UTC on October 31, when MARS will conduct high-power voice broadcasts, alternating between military stations on the East Coast and West Coast. MARS wants Amateur Radio operators to submit reception reports. For the remainder of the exercise, MARS personnel will be calling for Amateur Radio operators on the five 60-meter channels as well as on established Amateur Radio nets on HF and on VHF/UHF repeaters. Contact MARS with questions about this exercise. Registration for the October 25 webinar, "Overview of Army and Air Force MARS," remains open. The second IARU Region 2 (IARU-R2) Emergency Communications Workshop on October 11 focused on international issues facing Amateur Radio in emergencies and disasters. ARRL and IARU Region 2 sponsored the workshop, held in Viña del Mar, Chile, in conjunction with the IARU Region 2 General Assembly. ARRL Emergency Preparedness Manager and IARU Area B Emergency Coordinator Mike Corey, KI1U, and IARU Region 2 Emergency Coordinator Dr. Cesar Pio Santos, HR2P, co-chaired the event. Presentation topics reiterated and expanded upon themes discussed at the first Region 2 Emergency Communications Workshop, held in Mexico in 2013, and raised some new issues. Attendees came from the US and a dozen other countries, some outside Region 2. Workshop speakers represented national societies and organizations with an international scope, including the Federación Mexicana de Radioexperimentadores (FMRE), the Salvation Army Team Emergency Radio Network (SATERN), the International Telecommunication Union (ITU), the Radio Club de Chile (RCC), Amateur Radio Emergency Data Network (AREDN), and the Radio Club Venezolano (RCV). Topics covered the use of Winlink, SATERN support for Salvation Army disaster response, the role of ITU, developing operator and communication skills, AREDN mesh networking technology for disaster response, and emergency communication response in Venezuela. There continues to be a need for greater public education on the value of Amateur Radio. Specific ideas discussed included availability of print material and a social media presence for IARU Region 2 emergency activities. Events such as the Nepal and Ecuador earthquakes and the Philippines typhoon demonstrated the need for cached Amateur Radio equipment that can be deployed to support emergency communication activities. The availability of platforms such as Google Hangout, Skype, and similar virtual meeting programs make it possible to connect those in IARU Region 2 involved with Amateur Radio emergency communications. IARU Region 2 Area D Director Marco Gudiel, TG9AGD, asks a question during the ITU presentation. Exercises such as Cascadia Rising and Pacific Endeavor and events such as the Nepal and Ecuador earthquakes and Hurricane Matthew demonstrate the unique ability of radio amateurs to work together across political boundaries. Traditional modes of Amateur Radio communication, such as voice and CW, are vital to the ability to provide emergency communication in IARU Region 2. The development of operator skills through on-air activity and continued training...and wide use of new technologies and improved health-and-welfare messaging are encouraged. Work should continue on the IARU Emergency Telecommunications Guide, ensuring that it is relevant and useful to radio amateurs through regular updates and improvements. IARU Region 2 Emergency Coordinators will explore the possibility of an online emergency communication resource library, available to IARU Region 2 member societies and Amateur Radio emergency communication participants. Direct comments and questions to Mike Corey, KI1U (English) or to Dr. Cesar Pio Santos, HR2P (Español). Read more. "HF Mobile Antennas" is the topic of the latest (October 20) episode of the "ARRL The Doctor is In" podcast. Listen...and learn! On October 19, the log from the 14,000th National Parks on the Air (NPOTA) activation was uploaded to LoTW. It also put the ARRL program just shy of 750,000 contacts made from NPS units in 2016. With a little more than 2 months to go, the NPOTA community is abuzz with the possibility of breaking the 1 million QSO mark. NPOTA is the biggest operating event on the amateur bands this year. Tens of thousands of participants worldwide have gotten involved in NPOTA, learning a lot about the National Park Service and the country and history it preserves. There's still time to join in on the fun! Twenty-four activations are on tap for October 20-26, including the first-ever activation of Edgar Allan Poe National Historic Site in Pennsylvania, and Bandelier National Monument in New Mexico. Details about these and other upcoming activations can be found on the NPOTA Activations calendar. Keep up with the latest NPOTA news on Facebook. Follow NPOTA on Twitter (@ARRL_NPOTA). The International Amateur Radio Union (IARU) has honored past ARRL President and outgoing IARU Secretary Rod Stafford, W6ROD (ex-KB6ZV), with the Michael Owen, VK3KI, Memorial Award. Presenting the award plaque on the opening day of the IARU Region 2 General Assembly in Viña del Mar, Chile, was IARU President Tim Ellam, VE6SH/G4HUA. The award's namesake served as IARU Region 3 chair and as President of the Wireless Institute of Australia (WIA). Although Stafford is stepping down as IARU Secretary, he will continue to represent the IARU to the ITU Development Sector. Outgoing IARU Secretary Rod Stafford, W6ROD, receives the Michael J. Owen, VK3KI, Memorial Award plaque from IARU President Tim Ellam, VE6SH/G4HUA. The Owen Award is bestowed upon an individual with "an outstanding trajectory of service to Amateur Radio," IARU Region 2 said, in announcing Stafford as the award's recipient. Stafford's service to organized Amateur Radio began as ARRL Santa Clara Valley Section Manager from 1983 until 1986, when he took office as ARRL Pacific Division Director. He served in that post until 1990, when he became an ARRL Vice President. In 1992, the ARRL Board elected him to be First Vice President, and in 1995, he succeeded George Wilson, W4OYI (SK), as the 12th ARRL President, after Wilson suffered a stroke. He was ARRL President until 2000. Stafford served in several IARU Region 2 capacities and has been IARU Secretary since 2009. The ARRL Board has appointed former ARRL CEO David Sumner, K1ZZ, to succeed Stafford as IARU Secretary, a post he has held previously. Complete sets of ARRL November Sweepstakes (SS) records for both modes are now available, thanks to the efforts of Trey Garlough, N5KO, and SS Manager Larry Hammel, K5OT. Records are sortable by category, ARRL Division, and ARRL Section. A complete list of winners by category -- extending back to the first Sweepstakes in 1930 -- also is provided. For statistics fans, the number of logs submitted each year and a cross-reference of call signs are also available. "This is some nice work!" said ARRL Contest Branch Manager Bart Jahnke, W9JJ. "Is there a record in your location or favorite category that might be within reach this year?" The SS CW event takes place over the first full weekend in November -- this year, November 5-7. The SS phone takes place over the third full weekend in November -- this year, November 19-21. Sweepstakes begins at 2100 UTC on Saturday and continues through 0259 UTC on Monday. In addition, Hammel has updated the Operating Guide package that explains how to participate in Sweepstakes, including all rules and examples of log formatting, The Operating Guide is available for download. Jahnke said clubs or public service teams thinking about giving Sweepstakes a try this fall will find the guide a useful information source. A new system for submitting club eligibility lists has been under test and is available online. The deadline to submit an eligibility list is now the start of each contest -- November 5 at 2100 UTC, in the case of the CW Sweepstakes. Direct questions to ARRL Contest Branch Manager Bart Jahnke, W9JJ. Read more. 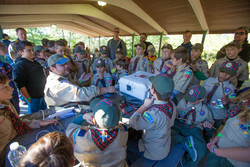 Now that Jamboree On The Air (JOTA) 2016 is history, the Boy Scouts are urging participants to file a JOTA Station Report in order to determine how things went. "It's your perfect opportunity to share your stories, photos, and some numbers," JOTA Coordinator Jim Wilson, K5ND, said. "The reports I've seen so far show some good turnout, particularly from Cub Scouts. We feel this is due to the new requirement for the Arrow of Light Award that asks Scouts to participate in JOTA-JOTI [Jamboree On The Internet]. This is also no doubt responsible for the big increase in JOTI registrations in the US, from roughly 100 last year to what looks like close to 500 this year." Reports are due by November 1. Every station that files a report will be entered into a drawing for an Icom ID-51A Plus dual-band handheld transceiver and will receive a 2016 Jamboree On The Air certificate. Only Boy Scouts of America stations are eligible. "Worldwide we had 11,534 register for the event," Wilson said, adding that a rough estimate indicated 800 US registrations and nearly 300 of those indicating Amateur Radio call signs. If that number holds, he said, it would indicate a dip in JOTA participation from 2015, when 346 turned out. "Some of that [in 2015] could have been due to the complexity of the registration system," he allowed. "I assure you that the reporting system now is much simpler. Wilson said the US JOTA 2016 Report should be out in early December. Read more. For the third year in a row, the Amateur Radio Emergency Service and the Radio Amateur Civil Emergency Service (ARES/RACES) were a featured component of the largest gathering of tribal disaster preparedness, recovery, hazard mitigation, and homeland security professionals in the US. The annual conference, held in mid-September, was organized by the National Tribal Emergency Management Council and hosted by the Tachi-Yokut Tribe at their Santa Rosa Rancheria in Lemoore, California. Radio amateurs were prominent among the conference presenters. Two ARRL San Joaquin Valley (SJV) Section groups, Fresno ARES/RACES and Tulare County ARES, pooled resources and set up special event station N8V, with multiple operating positions, on the lawn adjacent to the conference hotel. "Many conference attendees stopped by to view the display," SJV Section Emergency Coordinator Hal Clover, AD9HC, recounted. "Radiograms home were offered with several being sent via operators at the event." Throughout the week, many tribe members visited the special event station, picked up ARRL literature, and discussed building a stronger Amateur Radio presence within their tribes -- both as a way to support their emergency and disaster preparedness and to bring their communities together. NTEMC Chairman Richard Broncheau, KG7NRJ, welcomed attendees on opening day, September 21, and NTEMC Executive Director Lynda Zambrano, KE7RWG, provided a NTEMC "Year in Review." Later in the day, Adam Geisler, KJ6YHN, of the La Jolla Band of Luiseño Indians, was a panelist at an open forum, "FirstNet Unscripted," about the First Responder Network Authority. Breakout sessions on September 21 and 22 included a presentation on the National Tribal Amateur Radio Association by Nathan Nixon, N7NAN, Public Safety Programs Director with the Inter Tribal Council of Arizona; "FirstNet's Second Steps: Real world applications for tribal emergency response," with Geisler and Rita Mooney, KG5JAT, Texas Department of Public Safety among the panelists; "Introduction to CAMEO," a free suite of applications for planning and responding to chemical emergencies, with Elisa Roper, KM4BUG, Tribal Liaison with FEMA Region IV, and Al Finkelstein; and "Administration for Children and Family Services -- IDCM," with Wendi Ellis, KK6WQO, Regional Emergency Management Specialist in FEMA Region IX, and Stephen Miller as presenters. Nixon co-hosted a presentation, "Join us for our First Tribal Coast to Coast Exercise." Simulated emergency messages for an earthquake scenario were sent via Amateur Radio from the conference special event station to FEMA Region II in New York. 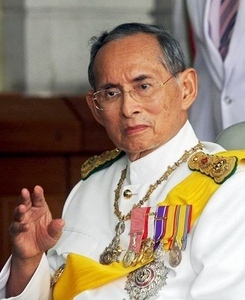 Thai King Bhumibol Adulyadej (Rama IX), HS1A, died on October 13, after a long period of declining health. Born in Massachusetts while his physician father was at Harvard University, the king, whose name translates as "strength of the land, incomparable power," was 88. Noted DXer Fred Laun, K3ZO/HSØZAR, said the king was never very active on the air, and mostly operated using a handheld on 2-meter FM. The king also enjoyed photography and jazz, and played the saxophone. The first sentence of the article "Current Rules Holding Hams Back from Adopting State-of-the-Art Technology, ARRL Says," in the October 13, 2016, edition of The ARRL Letter, should have said: "In comments filed on October 12 with the FCC, ARRL reiterated its case that the FCC should change the Part 97 rules both to delete the symbol rate limits in Section 97.307(f) and replace them with a maximum bandwidth for data emissions of 2.8 kHz on amateur frequencies below 29.7 MHz." We apologize for the error. Ambarish Nag "Raju" Biswas, VU2JFA. Report -- Radio Amateurs in India Monitoring "Highly Suspicious" VHF Communications: Authorities in India have asked radio amateurs along the Bengal-Bangladesh border to monitor strange VHF radio transmissions that one of them has called "highly suspicious." According to an article in the Hindustan Times, the signals were being heard in the dead of night, with participants said to be in motion and speaking in some sort of code. 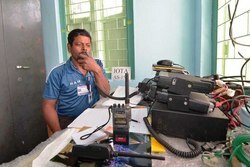 "After we wrote a letter highlighting the strange signals to the Ministry of Communication and Information Technology, we were called in for a meeting by officials of the international monitoring station in Kolkata on September 22," recounted Ambarish Nag "Raju" Biswas, VU2JFA, the secretary of the West Bengal Amateur Radio Club, in the report. The newspaper account said that when the Bengal hams attempted to contact the suspicious stations, the operators briefly quit transmitting. "We were asked to continue the monitoring," the report quoted Biswas as saying. "It is a cause for concern for us all, since the location is close to the Bangladesh border, and the callers were taking in codes and words with Bangladeshi pronunciation." The operators, who were speaking in Bengali and Urdu, also used numerical codes, according to the report. ARRL Members with AOL Accounts Report Problems Receiving ARRL E-Mailings: Since late September, ARRL has experienced intermittent problems delivering bulk e-mail products, such as The ARRL Letter and Section Updates, to member subscribers with AOL e-mail addresses. The problem is that AOL is not accepting all messages ARRL is sending; some make it through to the subscriber, and some do not. The League has open trouble tickets with AOL regarding this issue, but has not yet received any substantive responses. As a result, there is no estimated time frame to resolve this problem. Delivery to all other major Internet Service Providers continues to operate normally. If you have an AOL.com e-mail address and have been affected by this, ARRL suggests that you set up a new e-mail account with another provider and change the e-mail address in your member profile to the new account (click on "Edit your Profile" on the ARRL home page, after logging in). This problem is not specific to ARRL, as many other organizations are reporting the same problems with their AOL subscribers. Antenna Fire Puts SAQ Alexanderson Alternator Station Off the Air: An early October fire in the SAQ Alexanderson alternator long-wave antenna is under investigation by the Grimeton World Heritage Foundation, which owns and manages the station in Grimeton, Sweden. The fire, attributed to arcing, was quickly extinguished, and no injuries occurred. The Foundation said that determining the extent of damage and completing repairs could take a while. "There is a risk that the incident will affect the planned transmissions with the long-wave transmitter SAQ for some time to come," a Foundation announcement said. The fire will keep SAQ off the air for a scheduled UN Day transmission on October 24. SAQ, which operates on 17.2 kHz, also typically schedules transmissions on Christmas Eve and other occasions. Built in the 1920s, the Alexanderson alternator -- essentially an ac generator run at extremely high speed -- can put out 200 kW but typically is operated at less than one-half that power level. Once providing reliable transatlantic communication, it is now a museum piece and only put on the air on special occasions. Tad Cook, K7RA, Seattle, reports: Over the past week, October 13-19 average daily sunspot numbers declined from 55 to 31, while average daily solar flux dropped from 101.9 to 83.4, compared to the 7 days previous. The planetary A index increased from 6.6 to 19.1, and the average mid-latitude A index jumped from 5 to 14. Compared to the previous reporting period, this is just the opposite of what happened 2 weeks ago, when A indices decreased, but solar flux and sunspot numbers rose. 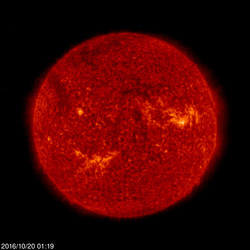 The October 19 prediction for solar flux shows these values: 78 on October 20-21; 80, 78, and 75 on October 22-24; 80 on October 25-26; 75 on October 27-29; 80 on October 30; 85 on October 31-November 5; 90 on November 6-8; 85 on October 9-11; 80 on November 12-14; 75 on November 15-19; 70 on November 20-22; 75 on November 23-25, and 80 on November 26. Predicted planetary A index is 5 on October 20-21; 20 on October 22-23; 36, 44, 38, and 20 on October 24-27; 15 on October 28-30; 25 on October 31; 12 on November 1; 5 on November 2-5; 8 on November 6; 5 on November 7-10; 10, 24, 26, 12, and 8 on November 11-15; 5 on November 16-17; 12 and 22 on November 18-19; 35 on November 20-22; 20 on November 23; 15 on November 24-26; 25 on November 27; 12 on November 28, and 5 for November 29 and beyond. Here is an article about a nearby star that seems to exhibit sunspot activity. Sunspot numbers for October 13 through 19 were 41, 38, 35, 25, 23, 24, and 31, with a mean of 31. The 10.7 centimeter flux was 95.3, 92.8, 84.9, 80.9, 76.2, 77.4, and 76.5, with a mean of 83.4. Estimated planetary A indices were 43, 24, 11, 18, 20, 11, and 7, with a mean of 19.1. Estimated mid-latitude A indices were 30, 20, 8, 13, 12, 10, and 5, with a mean of 14. This weekly Solar Update in The ARRL Letter is a preview of the Propagation Bulletin issued each Friday. The latest bulletin and an archive of past propagation bulletins is on the ARRL website. NCJ -- National Contest Journal. Published bi-monthly, features articles by top contesters, letters, hints, statistics, scores, NA Sprint, and QSO Parties.